Just like the RAW reviews, SmackDown reviews have gone the way of the Discussion Post. I’ll acknowledge various commenters’ frustrations with it by putting things this way: If you quit commenting in protest, then we can pretty much say goodbye to any analysis here whatsoever. No pressure. The guy who tried to start a “Husky Harris” chant during Bray Wyatt’s opening promo was neither clever nor funny, in case anyone was wondering. Dean Ambrose spending his night looking for Baron Corbin makes sense, because unlike Corbin, Ambrose has an actual reason to want to beat the crap out of him after the Elimination Chamber match. Of course, Corbin is the same guy who planned to win the Royal Rumble match and then somehow main event WrestleMania against himself, so he’s not completely in touch with reality. Corbin dragging Dean Ambrose out from backstage is a beautiful image though, proving yet again that SmackDown knows what it’s doing with the Lone Wolf. Also: He just saved James Ellsworth’s life, and while I’m not asking that Ellsworth drop Carmella for Corbin, I’m interested to see how cocky Ellsworth gets after not being murdered by Ambrose. I know there’s been a lot of discussion lately about whether or not American Alpha’s over (for what it’s worth, the Anaheim crowd gets really into them). One thing I want to point out is how American Alpha’s currently missing something that helped make them so likable in the first place, outsider of their technical proficiency: Their goofy friendship. It’s something that’s been gone since JBL told them to get rid of the “READY WILLING & GABLE” towels and catchphrase (you know, something for the audience to latch onto) and be more serious, on Talking Smack back in December. JBL was also single-handedly responsible (even as the voice of what was possibly being shouted in his headset) for the Ascension’s humble beginnings on the main roster as the biggest joke of a tag team possible, and that has yet to change here. Ron Simmons or not, JBL’s onscreen “help” for tag teams isn’t helping. Nikki Bella and Natalya are facing off in a Falls Count Anywhere match next week. Again, no pressure. 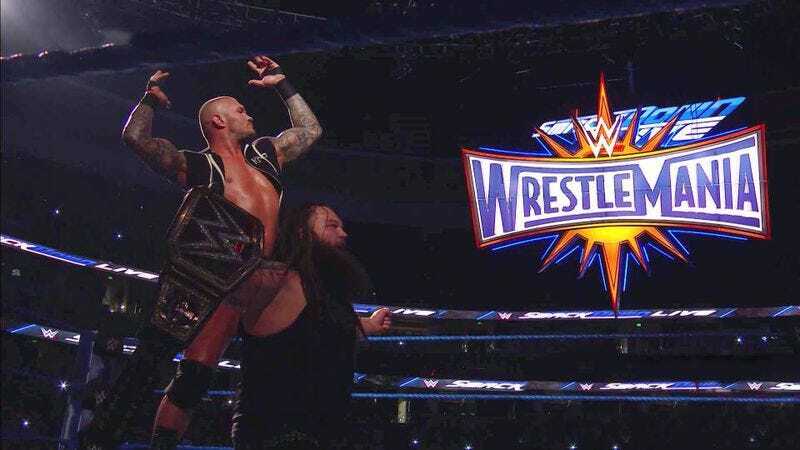 As the Road To WrestleMania is officially underway, it’s becoming increasingly more difficult to avoid discussing the storytelling choices being made without addressing WrestleMania rumors. That’s a major difference between WWE and most television, because you can still be heavily invested in television discussion without necessarily being buried in the spoilers. Heavy WWE (out of any other wrestling promotion) discussion, on the other hand, makes it almost impossible to avoid spoilers or rumors that turn into spoilers, especially when plans tend to rely on things like injuries, who’s well-liked/”in the doghouse” behind-the-scenes, WWE wanting to hit a specific demographic, or… Well, there are a lot of factors and variables in WWE, and while it’s still easy to enjoy the shows with rumors circling your head, the realization that rumors aren’t just rumors (especially the more far-fetched ones or ones you hope aren’t true) is a feeling you can’t really get outside of WWE. The one television exception to this phenomenon I can really think of is in Dexter’s final season, around the time the series finale spoilers leaked. The general consensus at the time was that the spoilers were perhaps too ridiculous to be real… until the season progressed in a way where it was obvious how real the majority of the spoilers were. Dolph Ziggler’s vendetta is specifically against the New Era (kind of like Cena, really), and while the entire concept is still problematic in terms of WWE getting the reaction it wants—the crowd of course cheers his promo about none of these “younger generation” guys stealing his spot—it does address something I’ve written about Ziggler before. That would be how WWE’s decision to sign and utilize “indy darlings” these past few years has sort of been the worst thing to happen to a homegrown guy like Ziggler, who had years of not-so-secretly being one of the best wrestlers on the entire roster… and was essentially treated like crap for that. It’s even more of a jungle out there with this “New Era” though, especially as they’re passing him over. However, Apollo Crews and Kalisto aren’t really the best examples of people taking his spot. Two things of note about Naomi: 1. It appears she injured herself at Elimination Chamber, but at least she’ll be able to defend the championship at WrestleMania. 2. I’m way too amused by how Renee was obviously told to finally say Naomi’s name right the moment she won the title. The Triple Threat match between Bray Wyatt, John Cena, and AJ Styles couldn’t have been anything less than a really good match, but part of what made it so good was also part of what made it a frustrating viewing experience outside of the live audience. You see, the match always came back from commercial in the middle of actual action, not a headlock or something as boring. (Mickie James versus Becky Lynch went with the typical structure when coming back from commercials, by the way.) That might sound like a thumbs up, but when it comes to the actual flow of the match, the fact that it was non-stop action (seconds after the first commercial break, the Anaheim crowd was already chanting “THIS IS AWESOME”) made from an awkward viewing experience. If ever there were a time to bring back the picture-in-picture from a couple of the early SmackDown! Live episodes, it would be this match. Honestly, that should be the case for any SmackDown (or even RAW) main event match.